BBC 4 is showing a 3 part series of one hour documentaries entitled The Great Offices of State by Michael Cockerell. The first one, about the notorious Home Office, entitled The Dark Department was shown last night, but it is available online via the BBC iPlayer, for the next few days. Also interviewed were three of the four Permanent Secretaries (top civil service mandarins like the fictional - Sir Humphrey Appleby from the classic TV comedy / satire Yes, Minister) i.e. the people who really run the Home Office, in spite of the meddling and ill thought out polices imposed by the by the politicians. Several politicians and civil servants from the previous Conservative and Labour governments were interviewed as well. There was a brief look at some of the catalogue of disasters which the Home Office has been responsible for in recent years, and quite a bit of mention of the out of touch, "bunker mentality" of the Home Office collectively as an institution. No doubt the politicians babbled on at great length, but the soundbites which each of them got to broadcast, do seem to make them all seem a bit more human, given the impossible tasks which the Home Office claims to be able to deal with, and which they claim to be able to reform. However, we do wonder about John Reid's extraordinary attack by implication. on the Secretary of State for Defence ! I believe, very very strongly, that there should be one Minister at Cabinet level, one Secretary of State, eh, eh, who got up, every morning, and thought, my main task today, is the safety, and security, of the people of this country. And , the Home Secretary can now do that. So no Secretary of State for Defence thinks daily about the "safety and security of the people of this country" ? Really ? The Labour incumbents in charge of the Ministry of Defence (including John Reid himself) may well have all been as incompetent and useless in practice, as the Labour Home Secretaries, but it is unlikely that any of them did not bother to think daily about the "safety and security of the people of this country". 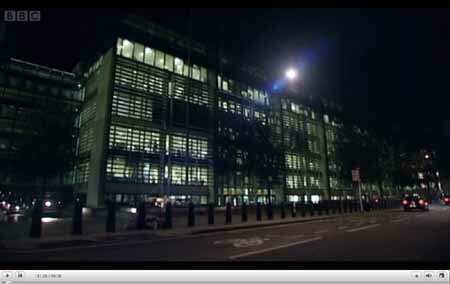 The most interesting bits of the programme, were those filmed on the day of the arrival of the newly appointed, current Home Secretary Alan Johnson at the Marsham Street headquarters of the Home Office. 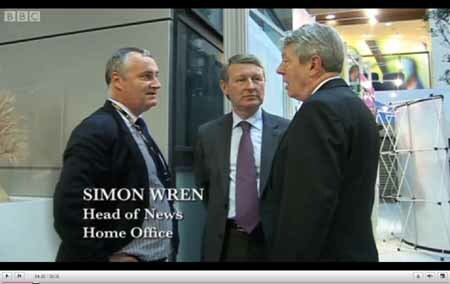 was shepherded about under the auspices of Simon Wren, the Home Office media spin doctor. Presumably whole committees of Home Office civil servants and securocrats and BBC bureaucrats checked the BBC footage, in case it inadvertently reveled some sensitive information. 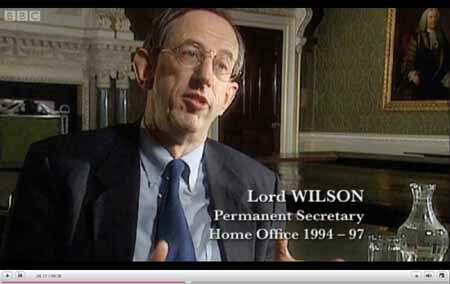 The scene (at around 9 minutes 23 seconds into the programme) where Sir David Normington shows Alan Johnson into his new office, displays a "blurred out" sign on the wall, the top half of which presumably might identify the location of the Home Secretary's office within the 3 building Marsham Street office complex. in the underground car park "meet and greet" scenes ? Obviously Spy Blog has censored these vehicle number plate images, but the "cat is out of the bag". The unobscured faces of the Ministerial Driver and the presumably Metropolitan Police armed bodyguard, were also clearly visible in several scenes. Was it really necessary to allow the audio sound to identify "Natasha" as the member of the Private Office staff who sits physically nearest to the Home Secretary's office, and who handles the Secret and Top Secret (paper) document folders ? (37 minutes 20 seconds into the programme) - pixellation by Spy Blog. Surely there should be a consistent policy for such censorship ? We simply cannot be bothered to alert the BBC or the Home Office to these potential security risks - they usually ignore such warnings (the Home Office certainly does its best to try to evade or ignore our Freedom of Information Act requests), or they try to "shoot the messenger". 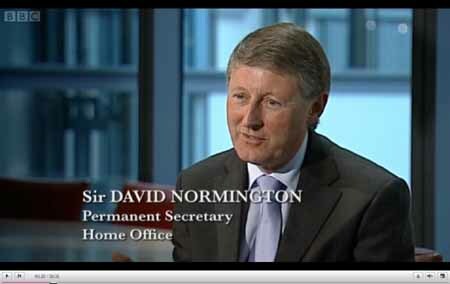 Who believes that the Home Office website www.homeoffice.gov.uk is worth spending £762,000 a year on ? Could someone please explain why so much public money is being wasted by the Home Office on their website each year ? To ask the Secretary of State for the Home Department how much his Department spent on its website in 2009-10. The amount spent on the main site and Home Office sub-sites is forecast to be £762,000 for the 2009-10 financial year. The taxpayer is being ripped off ! What exactly are they wasting over three quarters of a million pounds a year on ?? It is unclear if the supposedly independent Agencies, Quangos and NDBPs pay for their own websites out of their own, separate Home Office budgets or not. e.g. the Association of Chief Police Officers, the The Association of Chief Police Officers in Scotland , the Security Service MI5, the Office of the Chief Surveillance Commissioner etc. etc. The Press sub-website in particular is useless. It simply does not provide an up to date or even out of date but complete archive of even Home Office Press releases sent by email and fax to the mainstream media. We were astonished by how little work the >over 64 staff in Home Office Press Office appear to do, if you go by their online web (in)activity. We suspect that 60 Press Officers produce rather more than the meagre one or two Press releases a week which appear on the Press or Main home Office websites. 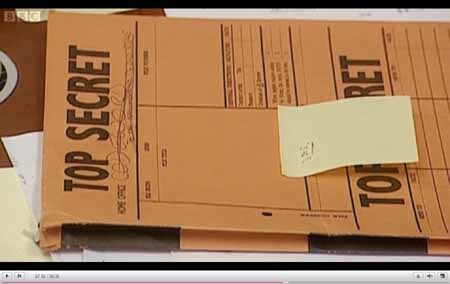 Surely the Home Office does not treat Press releases as if they were national security secrets ? Unless and until they publish all their Press release, Media Briefings, "lines to take" etc. on their website, in an easily searchable format i.e. HTMl web pages, RSS aggregation feeds etc., then they will always be seen as trying to spin / manipulate the media and to always be dishonestly hiding something from the public. Home Office: Press Office output for week of Mon 9th Feb 2009 ? All the other sections of the Home office website , are also very static, and the existing documents could be published and indexed automatically from the Microsoft Office originals, for virtually no extra cost at all. We repeat - what exactly are they wasting £726,000 a year of our money on ? Gordon Brown has handed the poisoned chalice of the post of Home Secretary to Alan Johnson, presumably to diminish his chances of becoming Labour party leader, after Gordon Brown is removed or resigns. Johnson is now the 6th Labour Home Secretary since 1997,and we have no expectation that he will be any more competent than his predecessors. No matter how much he smiles on television, he has obviously subsumed any principles he ever had as a former post man, former (?) Communist, and former Post Office workers Trades Union leader. When he was Trade and Industry Secretary, he oversaw some of the decline of the Post Office - will he resign when Mandleson now sells off most of the Post Office, or not ? As Education Secretary, he fell for the "Omega 7 fish oil capsules make children more intelligent / better behaved in school" hype and nonsense, and seemed to be advocating compulsory medication with the "snake oil". Alan Johnson has also spouted utter rubbish regarding the number of errors made by the Criminal Records Bureau. "And Education Secretary Alan Johnson said the number of mistakes was only 0.03 per cent of the checks carried out. He said: "We have to get it into context. This is not about unsuitable people being allowed to work with children, this is about erring on the side of caution and people who are suitable being caught in the system." The Alan Johnson / NuLabour spin approach is to divide the 2700 into 9 million and get a figure of 0.03% , he then claims that this is a statistically insignificant number, which it is. 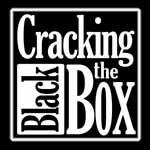 However if you divide 2700 the number of falsely reported criminals, by the number of alleged criminals (which includes the falsely accused ones) 25000, you get 1 in 9 negative CRB checks are false i.e. refer to innocent people, which is far, far too high a percentage. If there are 2700 people who have been falsely accused of being criminals due to mix ups with similar names and addresses, it is a reasonable hypothesis that at least the same number of criminals will have been given an "all clear" CRB check result, for the same reasons i.e. a false negative result. Will he be equally confused by Home Office crime statistics ? His time as Health Secretary has also been undistinguished - the wasteful and insecure NHS medical records data spine project and the continued losses of confidential NHS data continued under his stewardship. What happened to "Swine Flu" ? The re-shuffle at the the Minister of State level, sees Vernon Coaker moved to the Department for Children, Schools and Families. Presumably his replacement as Minister of State for Policing, Crime and Security is to be the Rt. Hon.http://www.theyworkforyou.com/mp/david_hanson/delyn" target="_twfydh" title="TheyWorkForYou.com - David Hanson - new window">David Hanson, who has been moved the Ministry of Justice from being the Minister of State responsible for the National Offender Management Service and youth justice i.e. for Prisons etc. Such is the incompetence of Labour Government re-shuffles and re-organisations of the Home Office, that these roles still need to be confirmed - the unlamented Tony McNulty (who has now left the Department for Work and Pensions and the Government, presumably due to his unseemly 2nd home allowance claims) and Liam Byrne (the former management consultant former "Android" and e-government software solutions salesman now seems to have been absorbed into the Treasury from the Cabinet Office) , swapped roles a few days after the split of the old Home Office which spawned the Ministry of (in)Justice. Perhaps there will be further changes at the junior Parliamentary Private Secretary level - depending on who else the vindictive unelected Prime Minister Gordon Brown and his henchman, the unelected doubly disgraced Lord Mandelson further annoy and harass out of Government. Will the Parliamentary Under Secretary of State for Identity Meg Hillier, who is so out of her depth when trying to promote the notorious ID Card and National Identity Register database scheme, remain, or will she join the several other women Ministers who have left, partly because of Gordon Brown 's misogynistic style of leadership ? Will the undistinguished Parliamentary Under-Secretary of State responsible for Crime Reduction, Alan Campbell survive ? 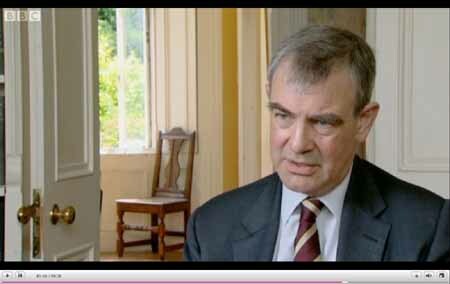 How much longer can the unelected Parliamentary Under-Secretary for Security and Counter-terrorism, Admiral Lord West of Spithead stand this Government ? Seven unelected Ministers (who do not have to pass any public appointment scrutiny hearings, like in, say the USA or the European Commission), is far too many, but it shows the dearth of talent amongst Labour MPs. One of the rumours which Sky News and the other mainstream media were on about last week, was that Louise Casey, the controversial former Home Office civil servant and NuLabour "anti-social behavior tsar" apparatchik, might become a Minister, which would also require her ennoblement, although, conceivably, she might be inflicted on the Department for Communities and Local Government rather than on the Home Office. 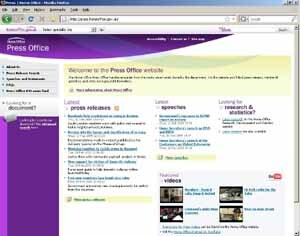 Where are all the Home Office press releases ? 177 spin doctors but only 5 press releases a week ? Councils and public bodies are to be able to access all email, telephone and internet records, sparking new fears over the surveillance state. Home Office Minister Vernon Coaker said: "It is the Government's priority to protect public safety and national security. That is why we are completing the implementation of this directive, which will bring the UK in line with our European counter parts. "Communications data is the what, where and when of the communication and plays a vital part in a wide range of criminal investigations, and prevention of terrorists attacks as well as contributing to public safety more generally. Without communications data resolving crimes such as the Rhys Jones murder would be very difficult if not impossible. "Access to communications data is governed by Regulation of Investigatory Powers Act 2000 (RIPA) which ensures that effective safeguards are in place and that the data can only be accessed when it is necessary and proportionate to do so". OK, he either does not know what he is talking about or he is deliberately conflating intrusive surveillance (e.g. bugs) - which aided the convictions in the Rhys Jones case - with mass surveillance (e.g. recording everyone’s telecoms), i.e. lying. If it ever takes the Police 12 months (the new Data Retention period) to start to use Communications Traffic Data to investigate the the murder of a child in public, then heads should roll, starting with the Home Office Ministers. Keeping millions of innocent people's Communications Traffic Data for 12 months would have done nothing to speed up or assist the investigation and prosecution of the Rhys Jones murder case, as this relied on targeted Communications Traffic Data requests and narrowly targeted i.e. electronic bugging devices placed secretly in one of the suspect's homes.. However, even today, Monday 16th February 2008, this official Home Office dedicated press release website is still only displaying a measly 5 press releases published last week, with no mention of Vernon Coaker's remarks. Continue reading Where are all the Home Office press releases ? 177 spin doctors but only 5 press releases a week ?. Jacqui Smith's speech to Intellect - do we have - "safeguards, openness, proportionality and common sense" - or a surveillance society ? What is your definition of a "surveillance society" ? It is probably not the same as Home Secretary Jacqui Smith's still secret definition. Home Secretary Jacqui Smith, like her Labour party fellow travellers, seems to be spewing Orwellian doublethink and newspeak, where normal sounding English words, have their meanings utterly reversed, without displaying any sense of shame, or pang of conscience, at their perversion. From now on, all of Home Secretary Jacqui Smith's policy statements will be analysed with these categories in mind. We suspect that she will be found wanting in all of them. Home Secretary Jacqui Smith delivered this speech to the Intellect Trade Association on December 16, 2008. Today I'd like to address one of the most pressing questions we face as a modern society - how we secure our rights and liberties as individuals, at the same time as ensuring the wider protection of all in our society against terrorism, crime and disorder. Balancing these individual and collective rights has always been a key responsibility of government. One which this increasingly repressive and authoritarian, yet morally weak, Labour government, has failed to get right. Continue reading Jacqui Smith's speech to Intellect - do we have - "safeguards, openness, proportionality and common sense" - or a surveillance society ?.